Blank books from Bare Books! A fresh set of markers in fun colors! (marker photo by Jenny's Crayon Collection). We LOVE the blank books from Bare Books: blank hardcover with paper pages, board books, softcover books, comic books, and even a blank game board! I've given them out in goody bags and used them for party activities. My sons and I have made many gifts for friends and family (below). As a professional crafter, my dirty secret is that I'm not much of a knitter. But I have such fond childhood memories of using my plastic tube knitter, perfect for a knit-phobic kid! You can make a super easy homemade toilet tube knitter using, obviously, a toilet tube, popsicle sticks, and tape or rubber bands and use it to make finger puppets, necklaces, and lots of other fun things! 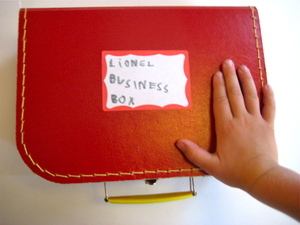 I assembled a business box for my boys, who loved their toy cash register and turned everything into a business. I included all the items list above as well as tags, play money, and a roll of tickets, "While You Were Out" pads, and more. 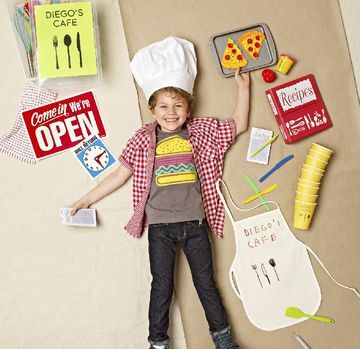 The restaurant play kit, below, is one I assembled for a story about imaginative play kits that I did for Parents magazine. More ideas for DIY imaginative play kits here! Ed Emberley's books are THE best! I have a special fondness for his thumbprint art books and any kid would love one his books along with a set of ink pads! Below are some of my younger son's thumbprint drawings. Easy Origami, by John Montroll, is the book that got my boys started doing origami. My older son became obsessed and we had colorful folded creatures and shapes everywhere (see his origami garland, below). Even now that he's older has other interests, we'll still have family folding sessions and our Christmas tree is covered in origami. My friend Kate introduced me to these fun notepads which allow kids to design their own outfits by drawing or collaging onto the pre-printed sheets. Playing ice cream shop or candy factory were two of our favorite activities during playdates. I gave the kids Play Doh, popsicle sticks, lollipop sticks, and ice cream cones that I made out of toilet tubes. Check out my post on Handmade Charlotte for other ideas for a Play Clay Sweet Shop! Give your crafty kid a craft book, such as mine (can't blame a gal for promoting her own book! ), and a few of the ingredients needed to do some of the projects! For some other ideas about how to turn a book into a gift kit, click here. What do you love to give to the creative kids on your list?